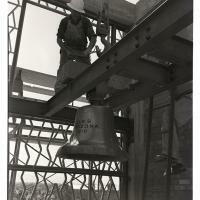 Oral history conducted by Ellen Lomonaco with Martin Kos in Tucson, Arizona on December 19, 1984. 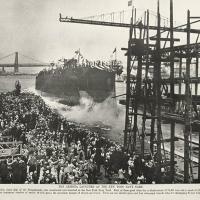 Mr. Kos was a member of the original USS Arizona crew in 1918, making him a plank owner. 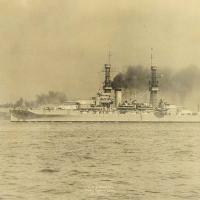 USS Arizona Passing Statue of Liberty, New York Harbor, New York City, NY. 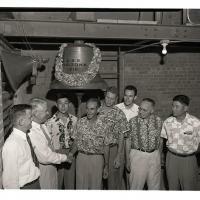 A group of gentlemen identified only as "the Hawaiian team" hangs a wreath on the ship's bell of the USS Arizona in the presence of UA President Alfred Atkinson in the bell tower at the UA Student Union. 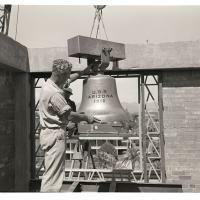 Workmen finish the installation of the USS Arizona's ship's bell in the University of Arizona bell tower at the Student Union. 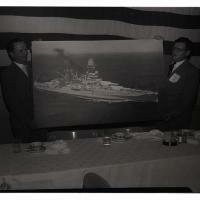 Dr. Richard Harvill, left, accepts an official US Navy photo of the USS Arizona and USS Arizona . 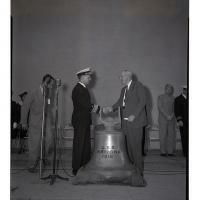 Presentation of USS Arizona bell by Rear Admiral Milton E. Mills to Dr. Alfred Atkinson, President of University of Arizona.